Request 1 or more size and color here. 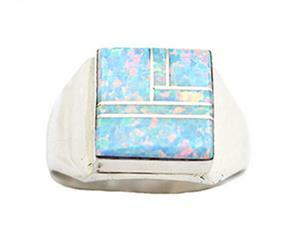 These sterling, small square, plain cast shanks are inlaid using cotton candy synthetic opal set in sterling bezel. Top measures approximately 1/2" by 1/2". They are crafted and inlaid by Navajo artisan Wilbert Gray. Also available in white synthetic opal in size 9, 9 1/2 or 10 1/2. Inlay patterns may vary. Cotton candy opal is in size 9 1/2, dark blue available in size 10, 10 1/2 or 11. *** Can also be worn by women. Choose color and size when ordering.